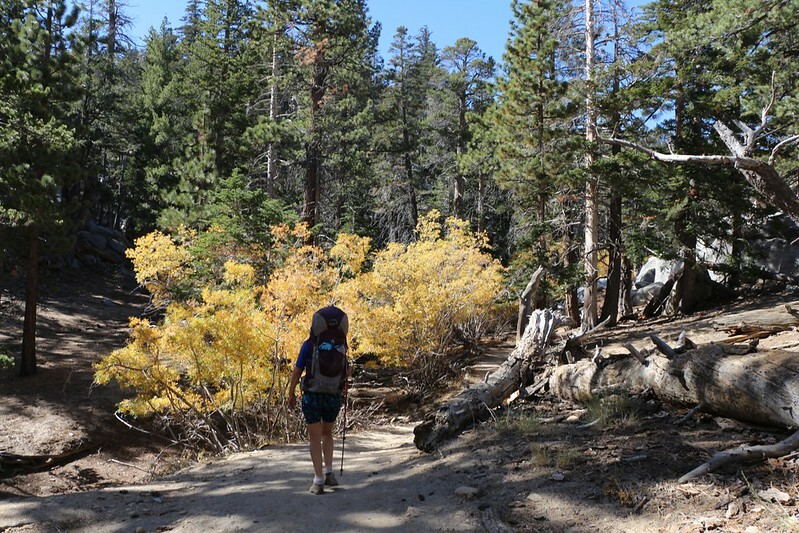 Vicki and I decided to take one last backpacking trip in the mountains this year, to get in some high-altitude relaxation before the holidays, and also to get in some hiking before the snow starts falling. First, the backstory: Long ago in June the two of us had great plans for getting in shape for our big summer trek. (Ten days in the North Cascades!) 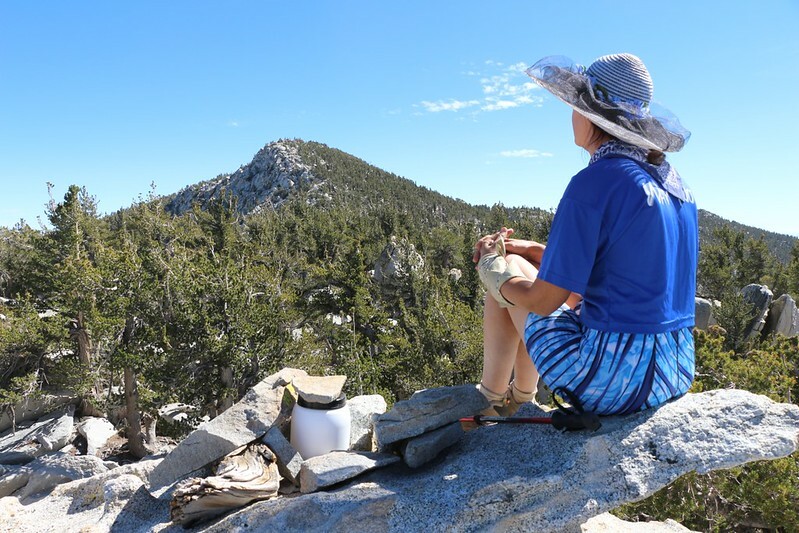 One small part of that greater plan was to backpack up to Little Round Valley via the Fuller Ridge Trail, spend the night, hit Folly Peak and San Jacinto Peak the next day, then stay a second night at LRV, and hike back out. A fun trip! But other things happened, instead. Annoying things that just HAD to be dealt with, and our plans were postponed. Meanwhile, the rest of our summer weekends had already been allocated. 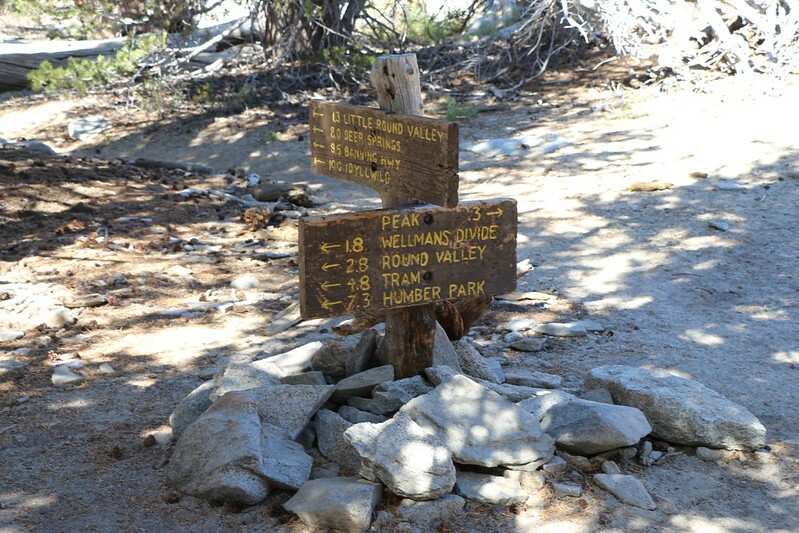 True, we had lots of fun on those other hikes, but Folly Peak remained unconquered. What with one thing and another, we couldn’t get away until mid-October. And we also got lazy. 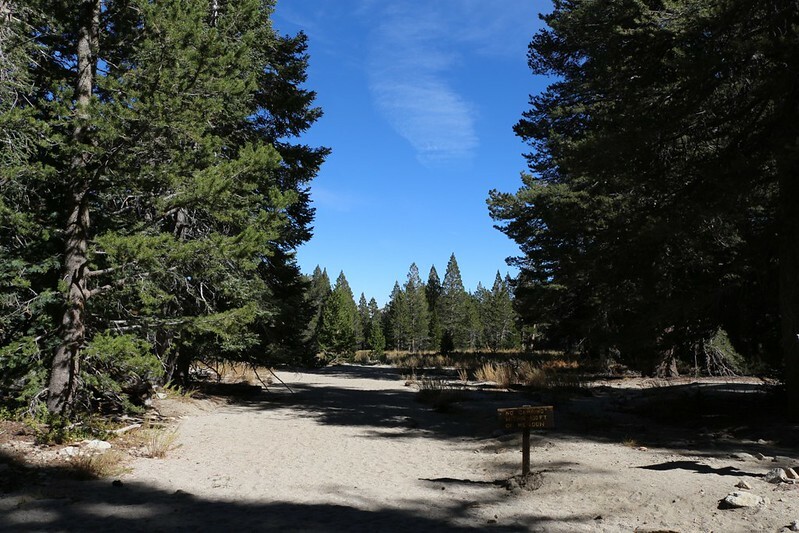 We decided to take the tram and camp in Tamarack Valley. Our big trek back in August was finished and we no longer needed to get in shape! 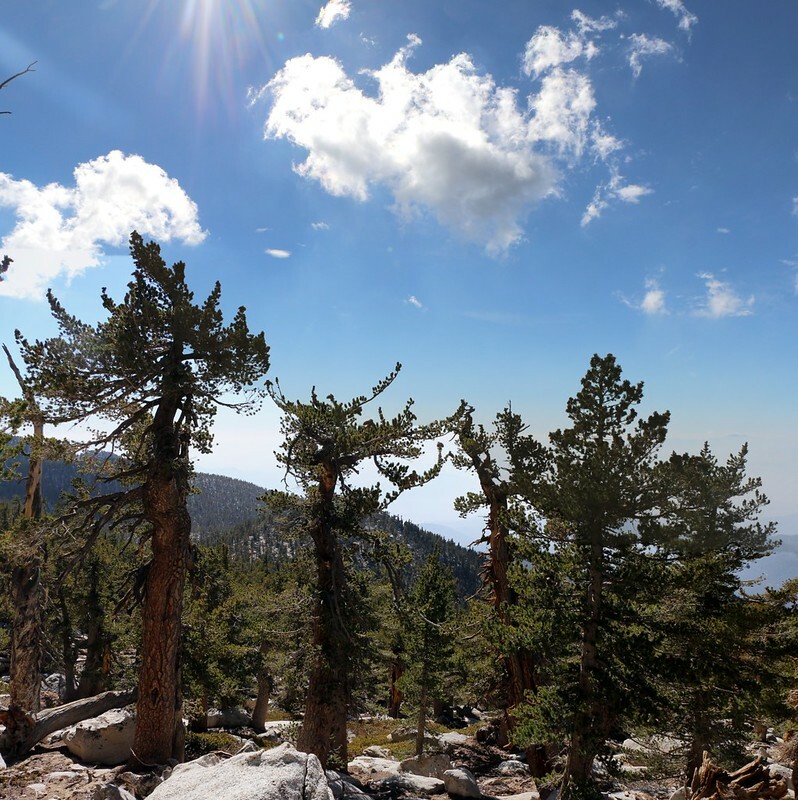 And that’s why we decided to take life extra easy this time, hiking in on a Friday, day-hiking to Folly Peak on Saturday, and eventually dragging our still-out-of-shape butts back to the tram on Sunday. It sure sounded easy when I got the permit. But soon enough I read on the board that even the Round Valley Spring had dried out! OK, we said. 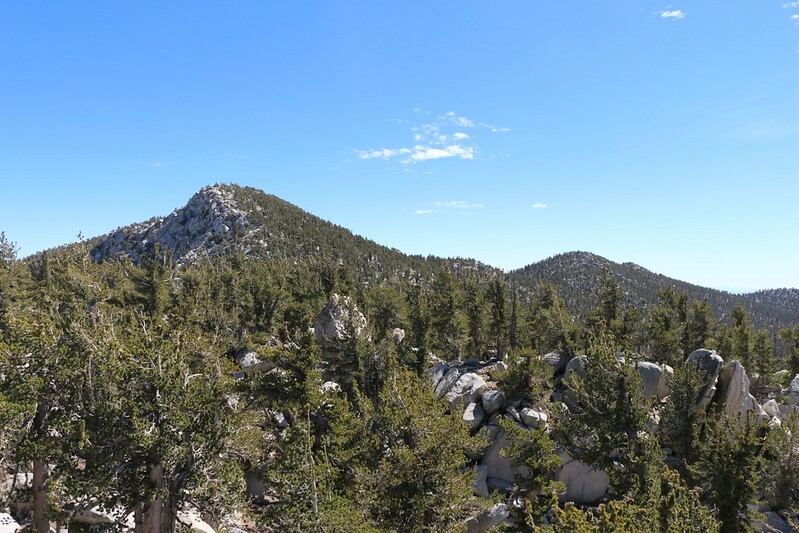 We’ll hike in, set up camp, then hike on back to Long Valley for more water. Three trips total, not one. 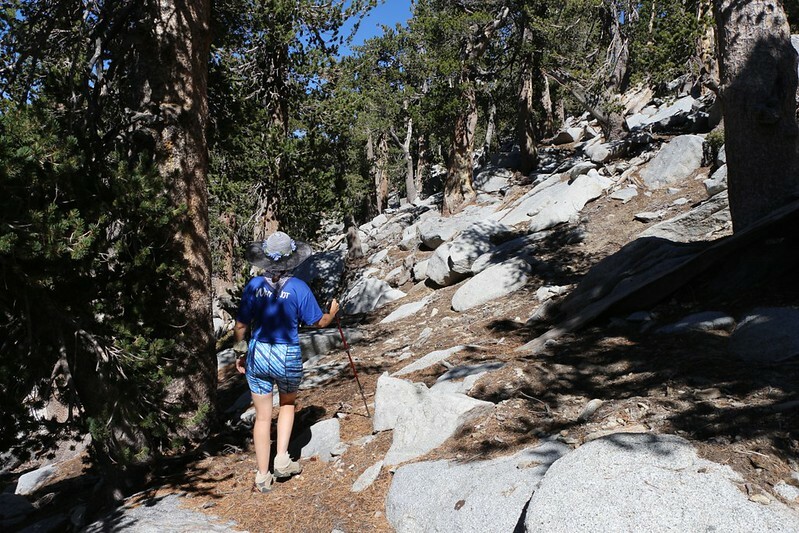 With all this extra hiking the Fuller Ridge Trail started sounding a whole lot better, but it was far too late to change the permit. So, we got up relatively late, drove up from San Diego, had breakfast in town, and took the first tram up at 10am on Friday the 17th. There was a sign at the lower tram station warning about the lack of water in Round Valley, but we already knew that. We headed for the Ranger Station and checked in, and discovered that other backpackers hadn’t seen the sign. They weren’t happy. They should’ve been reading this board! 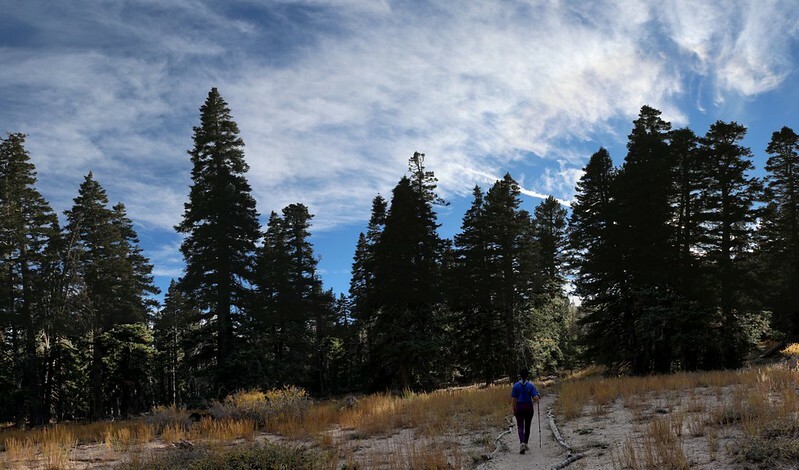 The ranger told us that we could get extra water from their hose out back, and on we hiked, heading up the Sid Davis Trail to Tamarack Valley. 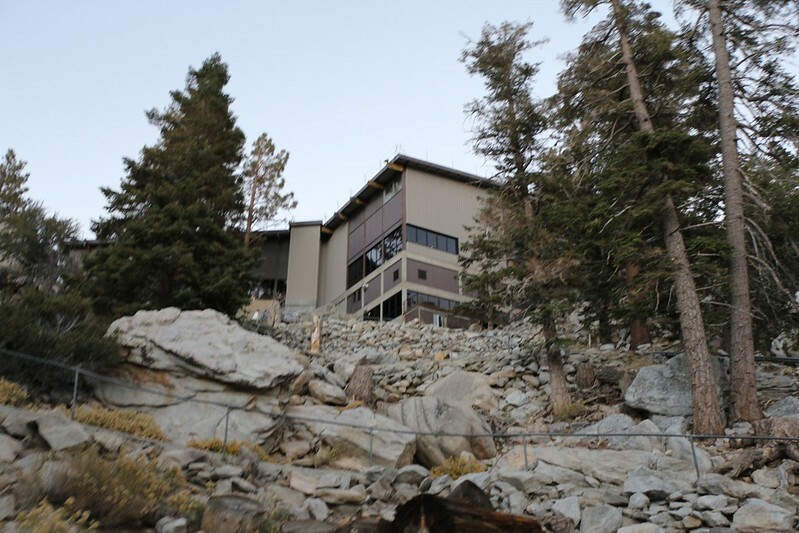 We’d stayed here before, and loved it for its relative isolation from the other campers in Round Valley. 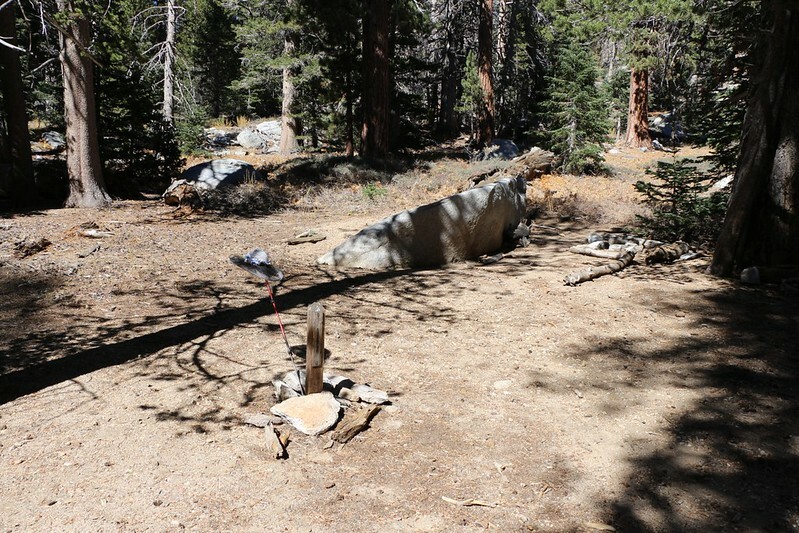 Not many people wanted to hike all the way uphill to this campsite. 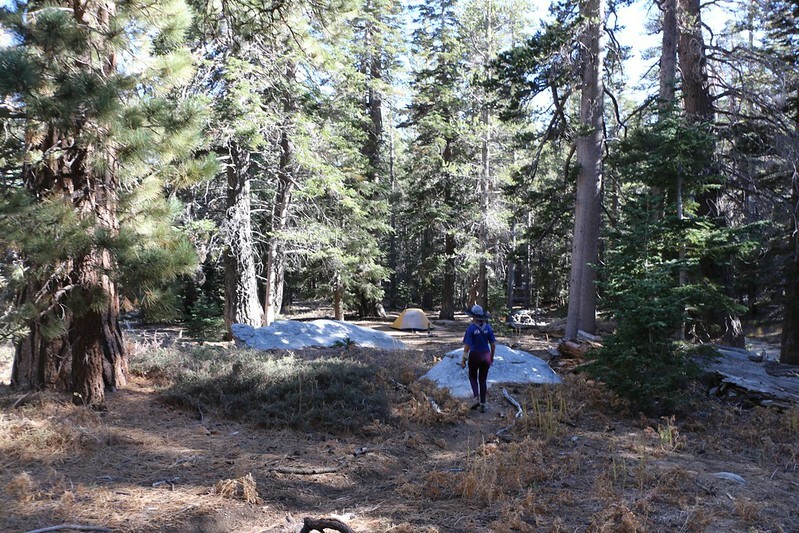 We set up camp, then emptied Vicki’s pack (except for empty water jugs) and headed the long way via Round Valley to get back to the Ranger Station. We wanted to check out the spring to see it for ourselves. 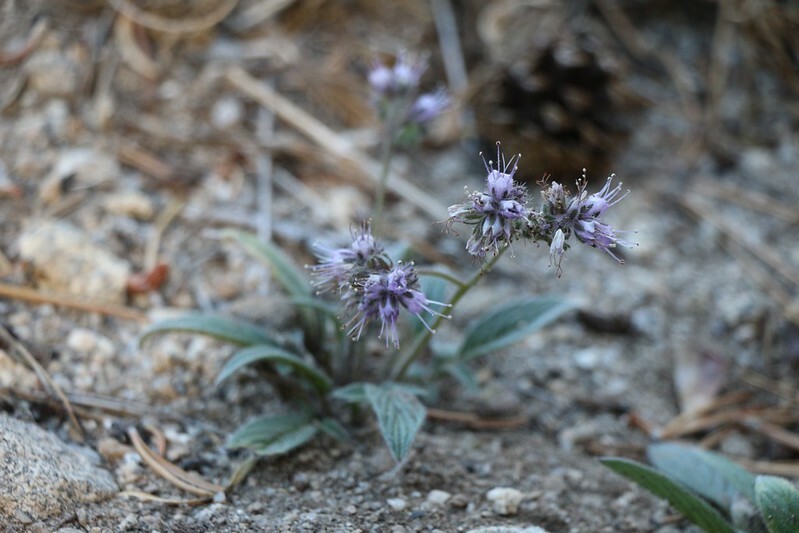 And, indeed, it’s true: Round Valley Spring has run dry this year. We filled up 2 extra gallons from this hose and carried them back to camp. 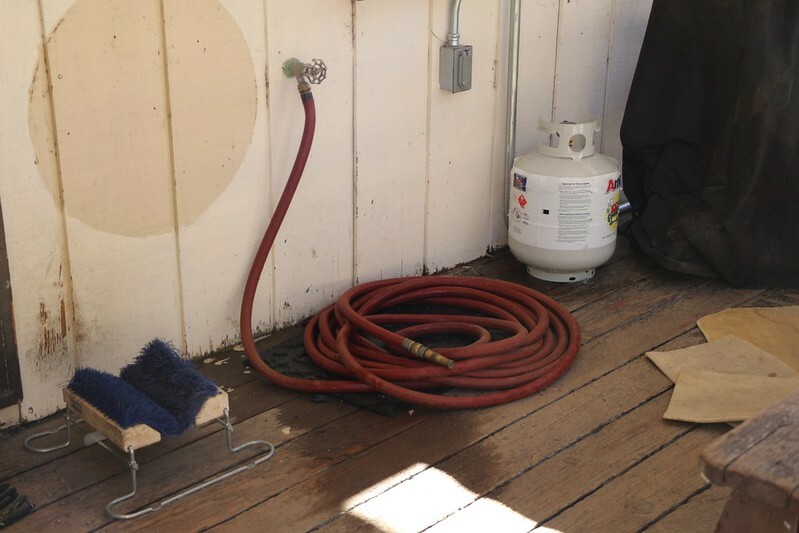 But WE MADE A BIG MISTAKE: We filled them directly from the hose, and not the spigot! 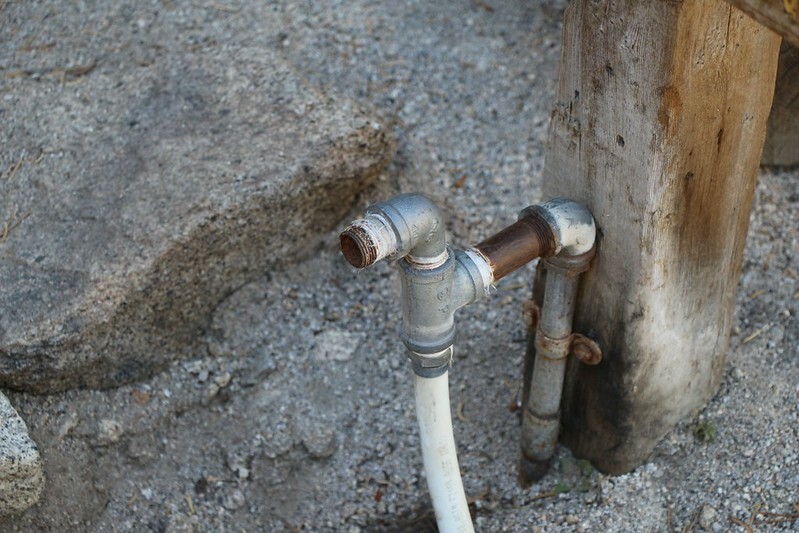 It wasn’t until we got to camp that we realized that all the water tasted like rubber hose! Bleah! It was drinkable, I’ll grant you that, and I’ve drunk worse-tasting water than that on the trail, but why didn’t I think to simply unscrew the darn hose first? Arrghhh! Saturday morning we slept in a bit. It was chilly and we weren’t in too big a rush. We stayed snug in our sleeping bag, waiting for the sun to actually strike the tent before getting up to make some breakfast. Then we got ready to hike. 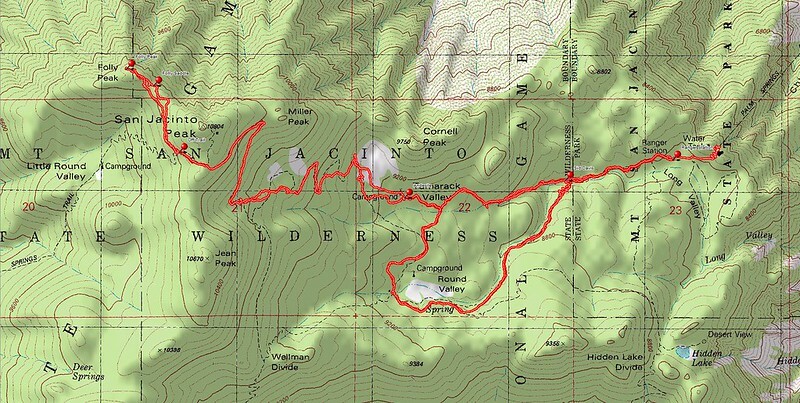 Our plan was to strike for the old unmaintained Tamarack Trail, our shortcut to the summit. Somebody needs to get some loppers up here! Luckily it’s all chinquapin and not buckthorn, or it would be impassable without wearing armor. 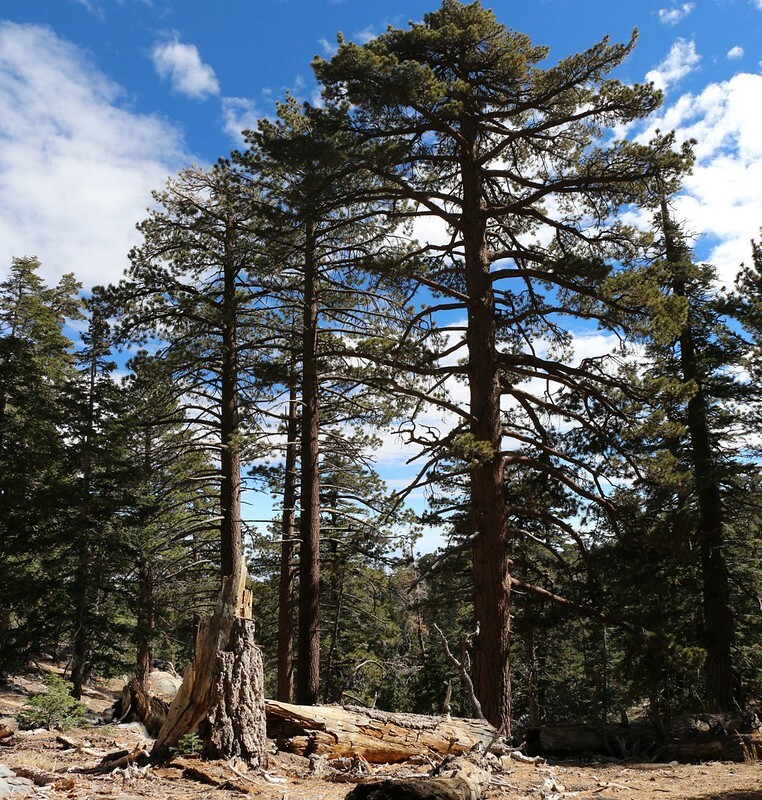 We hung a left toward Little Round Valley at the trail junction just below San Jacinto Peak. Call us foolish all you want, but we were heading for folly! 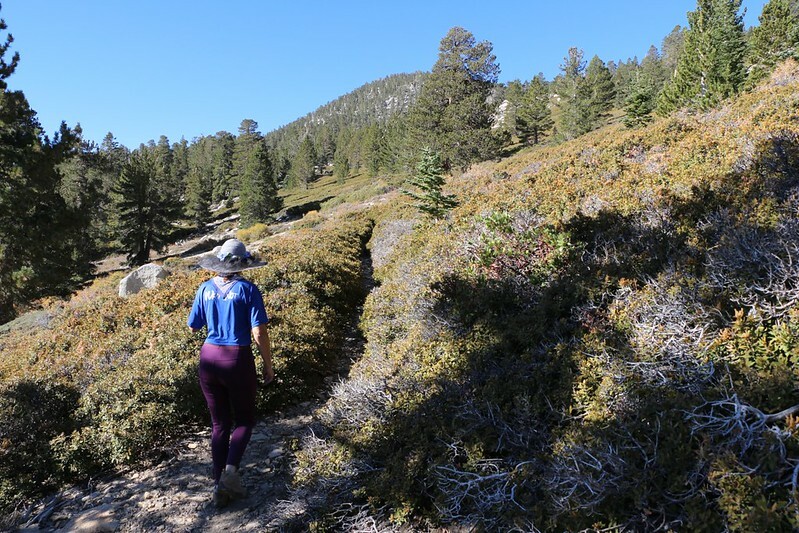 We took the Deer Springs Trail down toward Little Round Valley, but only until the first switchback, at which point we headed cross-country, trying to maintain elevation around the mountain. It was pretty easy hiking, no cliffs and minimal scrambling required. Class 2, maybe a touch of Class 3, depending on your route. Folly was a really cool peak, lots of big granite slabs and boulders. I liked it. A bit like Marion but nowhere near the exposure. And great views all around, of course, especially to the north and west. Pines in the sun on our way back to the trail from Folly Peak. It was a great day to be hiking! Vicki hadn’t been feeling all that great this trip; she’d come down with some sort of head cold, so we packed everything as fast as possible, and headed back to the tram. 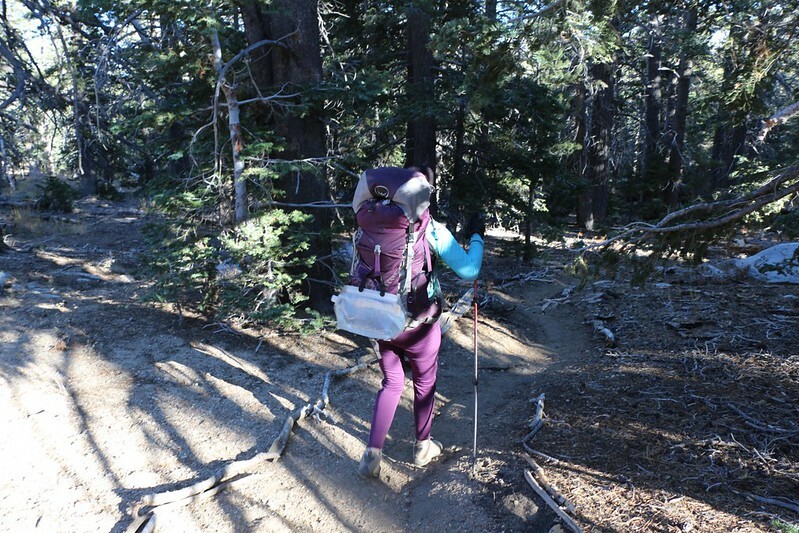 We carried our two gallons of extra water back to Round Valley to give to other hikers, so that all of our work the day before wouldn’t go to waste. And we found several folks who were thankful, and perfectly happy to drink that nasty “hose” water. Hooray! TThe Upper Tram Station from below on the cement ramps. The final ascent. 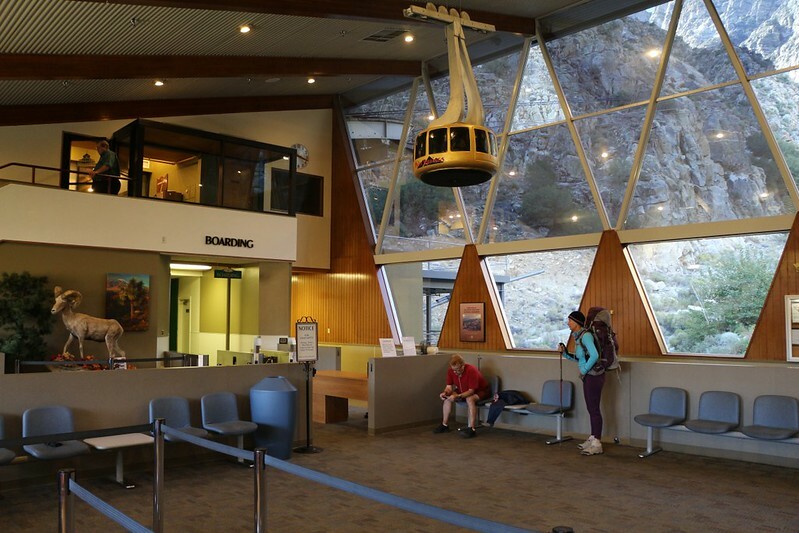 We made it back to the tram before sunset, ate dinner in Palm Springs, and arrived at home by 10pm. We decided that the mountain would still be there for us in the Spring, and that it was perfectly OK if it began snowing right away, so that all the ice-loving maniacs could start Winter Mountaineering immediately! 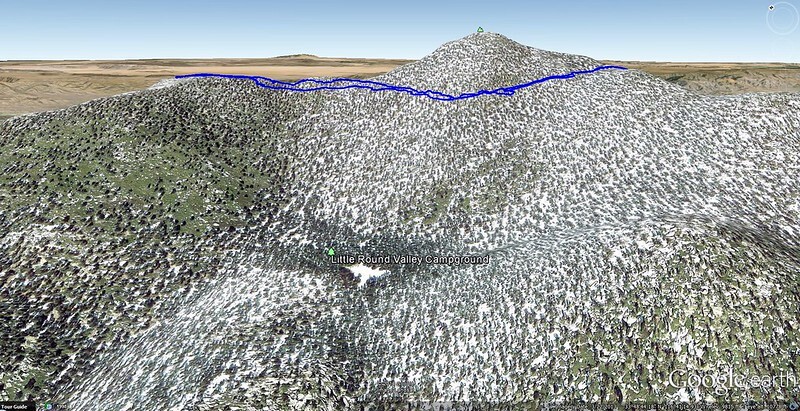 A Google Earth screenshot of our track showing the nearly level path we took sidehilling around the mountain to Folly Peak. Delorme Topographic Map showing our GPS tracks.